Since their introduction from Australia in the late 1800s, many of the 900 eucalyptus (Eucalyptus spp.) varieties have been widely planted in the U.S., from towering 120-foot trees to shrub varieties 4 feet tall. 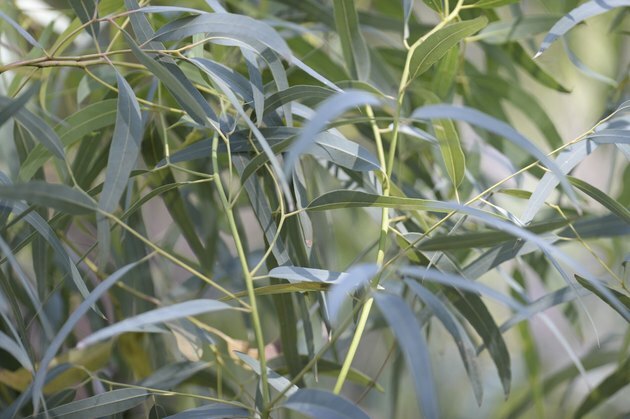 While different eucalyptus varieties have different shades of green, brown and gray in their bark and foliage, most share attractive peeling bark, pungent leaf aromas, quick growing habits and long lives. A few varieties have special advantages or disadvantages. Mallet eucalyptus varieties are those with single trunks and branches angled steeply upward with open space in between the branches. The sugar gum (Eucalyptus cladocalyx), which grows in U.S. Department of Agriculture plant hardiness zones 9 through 10, provides a good example, as does red-spotted gum (Eucalyptus mannifera), which grows in the same USDA zones. Both trees have slender, oval-shaped leaves, and grow 50 to 65 feet tall. 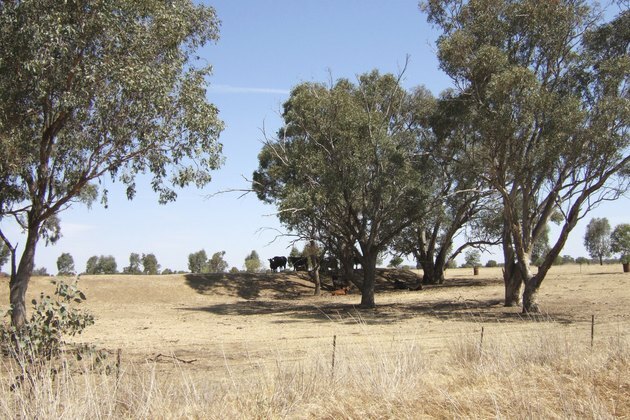 Of equal heights as mallets, marlock eucalyptus grow with branches that are more densely leaved, with leaves that come almost all the way to the ground. Fluffy, attractive, lime-green flowers and a 35-foot heigh make round-leafed moort (Eucalyptus platypus) a good marlock choice for yards in USDA zones 7a through 8b. An shorter tree, bushy yate (Eucalyptus conferruminata) grows from 10 to 25 feet tall in USDA zones 9a through 10b. 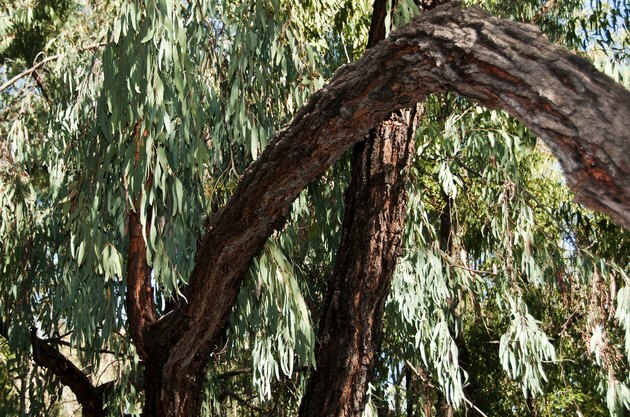 Shrub varieties of eucalyptus, also called mallee, are multistemmed and look like shrubs rather than trees. They typically grow no more than 10 feet tall in the high mountains and coastal cliffs in Australia, but given more hospitable conditions, varieties grow up to 25 feet tall, such as sand mallee (Eucalyptus eremophila) and red-flowered mallee (Eucalyptus erythronema). Both types grow in USDA zones 7a through 10b. Some eucalyptus varieties have both fans and detractors. 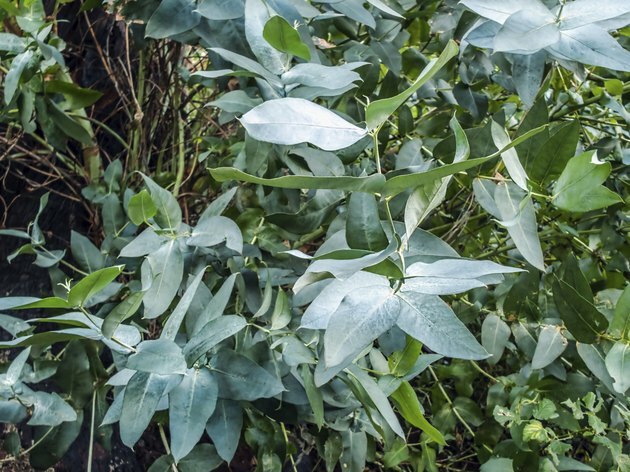 Florists love silver mountain gum (Eucalyptus pulverulenta), which grows in USDA zones 8 through 11, for its round, gray-green leaves that provide interesting color and shape in flower arrangements. On the other hand, some people shun blue gum (Eucalyptus globulus) as a fire hazard and a moderately invasive variety that can take growing space from other native trees where it thrives in USDA zones 9 through 10. Is Eucalyptus a Hard Wood or Soft?